This Portuguese cream from heaven (natas do céu) is very popular and makes an absolutely amazing dessert. Roll out the cookies into fine crumbs and set aside. In a small sauce pan, pour in 2 tablespoons of water and 1/4 cup of the sugar and stir. Heat the sugar until it forms into a light threadlike syrup but do not boil or allow it to become golden. In a small bowl, whisk the yolks with a teaspoon of the milk. 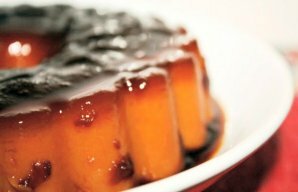 Gradually, while still whisking, drizzle in the sugar syrup, incorporating it thoroughly into the yolks and set aside. Beat the cream with 1/4 cup of sugar until it peaks form and set aside. In a separate bowl, beat the egg whites, until foamy and continue to beat on high speed while gradually incorporating 2 tablespoons of sugar. Fold the egg whites into the cream until the egg whites are thoroughly incorporated. 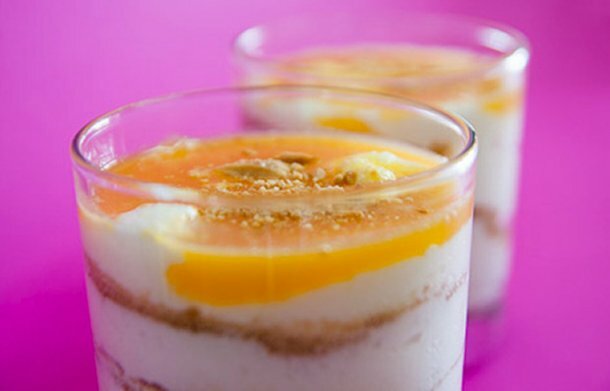 In alternate layers starting on the bottom of glass bowl or individual serving cups, add the cookie crumbs, pour a layer of cream followed by a layer of cookies until there's no more left, topping it all with the sweetened egg yolks. 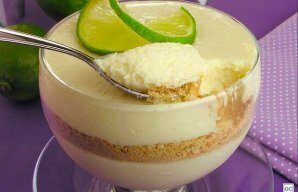 This refreshing Portuguese simple lime mousse recipe (receita fácil de mousse de limão) makes the perfect dessert. 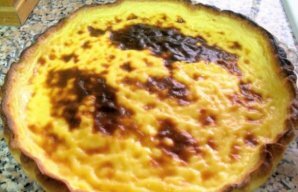 This Portuguese custard tart recipe (receita de tarte de nata) is easy to prepare and makes a delicious dessert. This Portuguese milk pudding recipe is very simple to make and absolutely delicious, enjoy.